Billy Harrow is a curator at London’s Natural History Museum who specialises in molluscs. One day, when leading a tour of the adjacent Darwin Centre, he is shocked to discover that “Archie”, the giant squid specimen he helped prepare for preservation, has impossibly disappeared. There are no cartoonish giant squid-shaped holes on the walls, of course, and simply no way the tank containing the squid could have been taken without anyone noticing. And yet this is only the first in a series of impossible events – Billy’s efforts to recover the squid are about to drag him into an alternative London filled with giant-squid worshipping cults, sarcastic police officers with supernatural knacks, Londonmancers who cut the city’s entrails to read the future, sentient and malevolent tattoos, familiars who demand better working conditions, disembodied union leaders, two terrifying villains by the names of Goss and Subby, and an eminent, chaotic, and seemingly unpreventable apocalypse. Kraken is nothing if not a strange and even somewhat messy book, but this strangeness is clearly intentional and even celebratory. This is a story about the wonderful weirdness of the world – it’s filled with a sense of wonder, though wonder of a darker sort than most of us are used to; of the potential behind the surface of things; of the hidden stories lurking behind everyday places and objects. While reading it I was frequently reminded of Neil Gaiman and Haruki Murakami, two authors I absolutely love. This should give you an idea of how much I enjoyed this book. Kraken is also filled with dark humour and infused with a constant sense of fun, and above all, it’s excellent and extremely compelling storytelling: I devoured its almost five hundred pages in only two days, and in the process may have finally been cured of my long-lasting reading slump. It had been a long while since I felt this immersed in a story, and it was wonderful to finally have this sort of reading experience again. As in the previous novels of his that I’d read, China Miéville treats London almost like a character. He celebrates the city’s history, geography and architecture, and doesn’t so much infuses it with magic as drags out the strangeness already there and pushes it a little further. The result is an urban landscape that’s every bit as familiar as it is original. Also, as I said when I read Un Lun Dun, what Miéville does with words is an absolute joy: his language is playful, vivid, and not in the least bit afraid of neologisms or not-quite-words or humorous over-the-topness. But beneath all this action and fun, there’s also a serious examination of the nature of belief, of memory, of history, and of the criteria we use to decide what’s ridiculous superstition and what are valid and reasonable narratives around which to organise our existences. The concept behind Kraken is very consciously Lovecraftian, but the execution is miles away from Cthullu’s cosmic terror. Yes, if you stop to think about it for five seconds, you cannot miss how absurd the cult of the Kraken really is. But then again, the same could be said of many of the stories we tell ourselves about the world. Miéville combines playfulness with an execution that actually takes this premise seriously and treats it with respect, and that’s one of Kraken’s greatest strengths. This does sound really good, but I cannot shake the suspicion that the Squid thing might easily make me uneasy and even scared. You know, waking up at night wondering if the squid is now in my bedroom. I have a weird mind like that. Nevertheless, this sounds like a book I should try to read. Iris, I know exactly what you mean. Squids (giant or not) and octopuses and other tentacled creatures kind of really freak me out :S But without giving too much of the plot away, I'll say that the poor giant squid doesn't actually *do* much. The focus of the book is what people see and believe about it and the meaning they attribute to it. Which is also what makes the book so interesting! See my fears are that I will roll my eyes at the silliness. But maybe not. Mieville is really clever, and I shouldn't underestimate that. If anyone can pull off an attack of the giant squid, he can. Mieville definitely has a way with words! I simultaneously was in awe and couldn't stop laughing at his pseudo-religious portrait of modern London. Really fascinating stuff and I'm so glad you liked it! I hadn't realised you'd read him before so will go and check your posts now. Sandy: My level of tolerance for silly and unlikely plots is probably higher than most readers's, but this is the sort of book even *I* would roll my eyes at if the author took himself too seriously. But what makes it work is that Miéville clearly doesn't - he's having fun and being playful all along. The bits that are over the top are very clearly intentionally so, and somehow that prevents the whole thing from ever crumbling. He's definitely the perfect author to pull this sort of thing off! Love the sound of this but I struggled with Miéville's writing last time I tried it. Time to give it another go perhaps as this sounds brilliant. This book sounds so incredibly strange, but also really interesting. I have a book by the author to try so hopefully will enjoy it. I really want to read this guy, and own a copy of The City and The City which is long overdue to reach the top of the pile. I'd also like to read this one, too. I've heard lots of good things about the postmodern sci fi mash up and would like to experience it at first hand. This sounds quite different than the usual Mieville and I can't wait to read it! Of course the trouble with reading him for me is that the sets the standard for other-world-ness so high, he makes many other stories seem inadequate! Definitely sounds fun, and I like the Gaiman/Murakami comparisons, two others who never fail to excite me. I did order this from the library the other day when you tweeted about it and hopefully I'll be able to work it in sometime soon. I must read more of his books. My husband is a big fan and just finished Embassay Town which he loved. I think I'll really like this one. I read Perdido Street Station a few years ago, and totally fell in love wit Mieville's weirdness. I have been so eager to try another of his books, and after having read Kraken, and having this book recommended to me repeatedly, I think I am going to have to scoot on out an buy this one very soon. Mieville has a way of really celebrating the extreme and strange, and it always keeps me so enthralled. This was a great review, and I am glad to hear that this book rocketed you out of your reading slump. Hopefully I can make some time for this one soon! China Melville is an author on my list of authors to investigate. I don't know anything about him or his books but have a vague, shapeless idea, probably from something I read a few years ago but don't remember now, that he's definitely worth reading. So I was thrilled to see your review here and after reading it, I know this is an author whose books I must read. I love the dark humor, the dark sense of wonder, the London setting, the rather bizarre story-line and more. Squids aren't among my favorite creatures, kind of slimy, weird and a little creepy but I can deal with that no problems. And it amuses me there's a squid worshipping cult! I tend to stay away from books with fantasy or supernautural elements except when they are incorporated into the story much the way they are here. Weird, I know! Thank you so much for this wondrful review. I'm excited to read Kraken and other China Melville books! Mieville's THE CITY & THE CITY was one of my favorite books of all time. I've had the KRAKEN on my list for a while - I think it's definitely time I got around to it. It sounds like a wonderful read. Rich bought this book a month or so ago, and I've kept telling myself that I really wanted to read it, without really quite believing myself. Almost more like a "I think I should want to read this." But now, dear Ana, you've made me mean it with a passion!!! This sounds sooooo freakin' good!!! I loved Un Lun Dun so I am intrigued by this one. I love the way he treats London like a character. I was at the store a couple weeks ago and came dangerously close to purchasing this. I love a little silly and ridiculous in my reading at times; perchance I shall have to go back and pick this one up now. Strange and messy sounds about right. But wonderful too :) I really loved this one. Truthfully just the comparison to Gaiman and Murakami has me sold. Oh my goodness, I must read this! You said everything I wanted to, Ana. I loved this book for the completely immersed reading experience, the outrageousness, the humour, London as a character, how much it reminded me of Neverwhere... Actually, I had a coincidental experience reading it to when I read Neverwhere, please remind me to tell you some time. Mieville is a new favourite author of mine and it's all thanks to you and Sakura. I'm one of the few people to have not read Mieville. I love London and worked in the Natural History Museum when I was there (and got to explore the basements and back rooms of that museum and others. Thus there are elements of this book that would definitely interest me. I guess I'd better track down a copy. Also, good to hear you beat the reading slump! 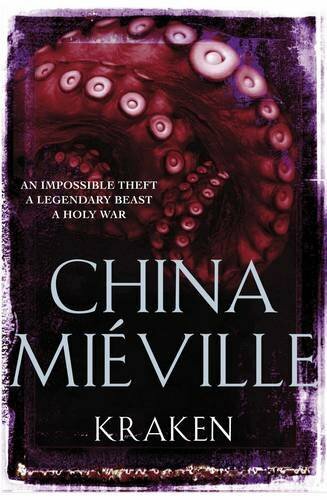 China Mieville has been on my radar for a while now. I remember I was going to pick up Un Lun Dun but didn't for some reason...Glad your reading slump is over! I really must get to this soon. I am curious about it. Sounds like the type of book Miéville had fun writing. Your description of the "wonderful weirdness of the world" also reminded me of Chuck Palahniuk, who I'm aware it not everybody's favorite, but can do weirdness like no one else. I can't wait to read this one. So many of Mieville's books are in my wishlist. Cool cover..love Miéville books, and i'm damn sure this one is gonna be a intresting one.. i'll definately read this one as soon as possible.. I love, love, loved this book. Actually, I've said that about every one of his books that I've read so far. :-) Messy and celebratory is a perfect description. Mieville has a way of creating intricate and wonderful stories you don't want to put down because you need to know where he's going with it. So glad you enjoyed it! I must have been hoping for more satire when I read the first half of this one and then lost interest and took it back to the library. All the good things you say about it were indeed pleasures; I just didn't get caught up in the story. Awesome, awesome book. I love China Mieville's work. Yeah - sounds like just my kind of thing, because as I'm learning the bizarer the better. It's when books start out going 'look at all the weird' but are afraid to really plunge in that I get annoyed. If you're going to write a weird book, commit! There's just something about the idea of a giant squid that really strikes fear in me. That being said, I would love to read this one. I haven't read any of this author's work and have heard great things about Embassytown (I think this is the name of the novel). I've started this book several times, but haven't yet managed to get past the first couple of chapters. It's strange because I've loved China Mieville's other books. After reading your review I'm going to give it another go. I bought this book awhile back and it has been languishing in my TBR pile. I've read King Rat and Un Lun Dun and after reading a blurb for Kraken I knew I had to read it! You know when you read book blurbs and the synopsis just sounds so amazingly absurd that you know you've just got to read the book? Yeah, that was me reading the Kraken blurb. So, it drew Neil Gaiman and Haruki Murakami associations for you. Now I really have to read it! I've seen this one floating around the blog-o-sphere for ages, and put it on my kindle forever ago, but have yet to get around to it. However, after your great review and seeing Mieville on a list of contemporary steampunk authors, I may finally have to give it a try! This is horribly late but I LOVED Kraken. :D You should read The City & The City - I'd love to know what you think. But beneath all this action and fun, there’s also a serious examination of the nature of belief, of memory, of history, and of the criteria we use to decide what’s ridiculous superstition and what are valid and reasonable narratives around which to organise our existences.